World map of the corruption perceptions index 2012 by the organisation Transparency International. 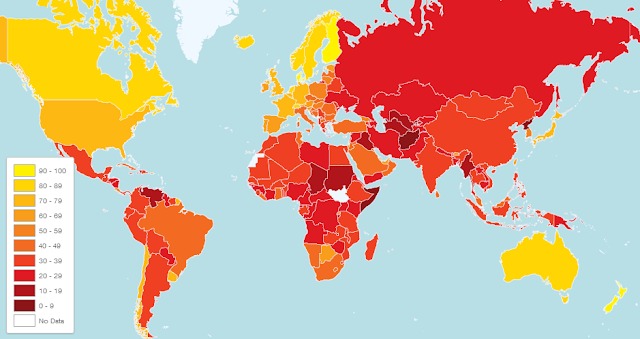 The Corruption Perceptions Index ranks countries based on how corrupt a country’s public sector is perceived to be. Corruption is an abuse of entrusted power. It hurts real people every day. Transparency International measures the degree to which corruption is perceived to exist among public officials and politicians. High numbers (yellow) indicate less perception of corruption, whereas lower numbers (red) an indicate higher perception of corruption. The corruptions perception index 2012 measures the perceived levels of public sector corruption in 176 countries around the world.